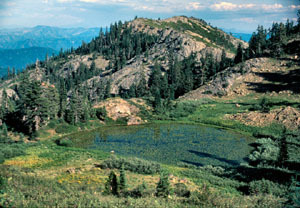 The United States Congress designated the Red Buttes Wilderness (map) in 1984 and it now has a total of 20,133 acres. California contains approximately 16,356 acres. Oregon contains approximately 3,777 acres. It is managed by the Forest Service. Red Buttes Wilderness straddles the crest of the Siskiyou Mountains (i.e., the rugged Applegate River/Klamath River divide), but has far more acreage in California than in Oregon. The twin summits of Red Buttes (highest elev. 6,739' a.s.l.) anchor the southern extreme of the area in California, where reddish peridotite rock, nudged up from a 425-million-year-old seafloor by plate shifts in the earth's crust, now supports unusual plant communities. The area's geology is ancient and very complex; some of the highest points were carved by glaciers during the last Ice Age. Some 35 miles of the Pacific Crest Trail skirts by Red Buttes Wilderness, near Lilypad Lake at the foot of the Buttes. Rocky buttes, forested ridges, and small glacial-carved lake basins characterize this rugged Wilderness, with a dense jumble of manzanita, snowbrush, and other brushy plants carpeting the dry south-facing slopes. Big sugar pines (some over 8' in dia.) dominate the lower-elevation forest of the Butte Fork canyon, which provides habitat for black bears, cougars, deer, and coyotes. ""Unsubstantiated"" (and almost certainly mythical) sightings of the infamous Bigfoot or Sasquatch may date back over the last century. On the eastern side of Oregon's portion, from the grassy dale of Sucker Creek Gap, a trail leads three miles through heavy tree cover along the tumbling course of Steve Fork. To the west, one can take the Tannen Lakes Trail one-quarter of a mile to Tannen Lakes, where you can swim below the rockslides of Tannen Mountain. You will probably see few other people on the trail. Although summers are typically dry, snow buries much of the higher country from November until May. Along the main Siskiyou Crest portion of the Boundary Trail, in California, the south-facing route requires the traveler to have plenty of water on hand. Along the Boundary Trail in Oregon (following the ridge that divides the Rogue River and Siskiyou National Forests), several miles outside of the Wilderness to the northward of Sucker Gap, is Oregon Caves National Monument. This Wilderness was named for the reddish-orange hue that a high content of iron and magnesium lends to the dramatic peridotite and serpentine formations of Red Buttes and adjacent Kangaroo Mountain. You'll find dense forest, lush meadows, dense brushfields, and steep rocky slopes rising to craggy peaks. Cold streams rush down heavily eroded canyons and through extensive stands of old-growth ponderosa pine, sugar pine, western white pine, incense cedar, and Douglas-fir. White fir, Shasta red fir, and mountain hemlock grow on the upper slopes. The endemic Brewer's spruce and Sadler oak, as well as Alaskan yellow cedar (on the far southern fringes of its natural range), and other unusual plant species are found here. The area's flora is among the most diverse in North America. Even the area's many different evergreen-broadleaf brush species are rarely found growing in such close proximity. Approximately 13 miles long and six miles wide, Red Buttes Wilderness features elevations ranging from about 2,800 feet in the lower Butte Fork Canyon to 6,739 feet on the east summit of the Red Buttes themselves. In the higher elevations, you'll find several small lakes huddled delightfully in scenic basins. Shallow Azalea Lake, the largest at 20 acres, sits in the western half of the California portion. In addition to black-tailed deer, black bears, cougars, and all manner of rodents and weasels, other wildlife are present. The rarely seen ring-tail cat (a reclusive relative of the raccoon) inhabits the area, peregrine falcons nest on remote cliffs, and bats roost in the rock overhangs and sinkholes near the Red Buttes. Trail 957 crosses the core of the area eight miles in an east-west direction, following the flow of the Butte Fork of the Applegate River much of the distance, and passing through one of the largest remaining old-growth stands of the Siskiyou Mountains' distinctive mixed-evergreen forest. Butte Fork Trail connects to trails leading into Oregon at Azalea Lake. The shores of Azalea Lake, the most popular destination on the California side, have heavily impacted by past lakeshore camping and horse use; camping is not allowed within 100' of the shore of any lakes. Planning to Visit the Red Buttes Wilderness? How to follow the seven standard Leave No Trace principles differs in different parts of the country (desert vs. Rocky Mountains). Click on any of the principles listed below to learn more about how they apply in the Red Buttes Wilderness.